About Shannon Boats | Shannon Boats. 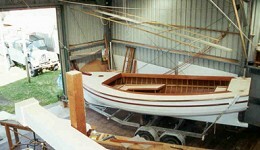 Boat Builder in Taree. See details on the Fission 500, Kayaks and Pulling Boats. 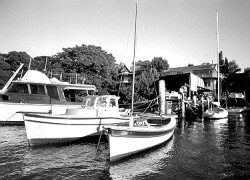 For many years as a schoolboy, I worked my weekends in a hire boat shed on Sydney’s Hawkesbury River at Berowra Waters. This developed my love and appreciation of wooden boats. 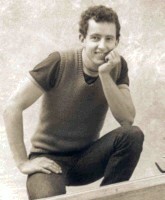 I went on to complete a successful apprenticeship as a shipwright/boatbuilder. After my apprenticeship I travelled for a number of years working on everything from Dinghy’s to Trawlers and even exotic furniture making. On my return I formed a partnership with another highly experienced boat builder Richard Wood and for 10 years we operated the most prestigious boat yard and slipways in Sydney Harbour at Snails Bay, Birchgrove. 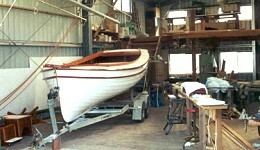 Our business “Timber Boat Services” had an unsurpassed reputation for outstanding quality of workmanship. I gave away city life in 1997 to fulfill a lifelong ambition of building classic timber launches and skiffs on a quiet coastal river with my wife Vicki and young family. Now, after 30 years honing my skills in the art of wooden boat building, I’m transferring my talents to producing what I believe to be the best fibreglass boat on the market for enclosed waters – the Fission 500. I hope you enjoy my site and if you have the time to view the promotional video it’s excellent viewing, as my words alone cannot do justice to my craft.